Is This the Guy Who Killed Bin Laden? Yesterday the Associated Press published a lengthy profile of "John," the secretive CIA agent who led the effort to locate and kill Osama bin Laden. The CIA asked the AP not to report John's full name or certain biographical details that might identify him, and the AP complied. But internet spy-hunter and data anarchist John Young, of Cryptome, thinks he's found a photo of this master spy. In the White House's Flickr feed. The AP story opens with the moment the famous photograph was taken of Obama and his aides in the situation room watching the bin Laden operation unfold. "Hidden from view," the story says, "standing just outside the frame of that now-famous photograph," was the agent who had tracked bin Laden to that moment. Well, Young looked at that photo, which is available here on the White House Flickr feed, and noticed a tall man with a yellow, patterned necktie standing just outside the frame. He checked it against other photos taken at the same moment and found one (above) with the man, and his necktie, in full view. The AP story also notes that "two days after bin Laden's death, John accompanied [CIA chief Leon] Panetta to Capitol Hill" to testify before the Senate intelligence committee about the operation. 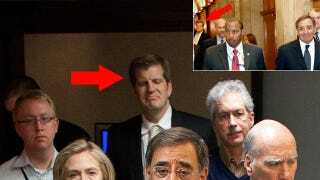 Young found a photo of Panetta leaving that briefing on May 3, and sure enough, there in the background is the Man With the Yellow Tie. Of course, it could be a random staffer who happened to be in both locations with John. Or it could be the guy who iced bin Laden, whose identity is so secret that the AP agreed to alter its story to suit the CIA's wishes, and whose photo was distributed by the White House.